Have you ever tried to Google “How much does it cost to build a restaurant”? Information is pretty thin on the ground in our experience. You will get some cost per sq. ft. numbers from the US, but how does that relate to working in the UK? 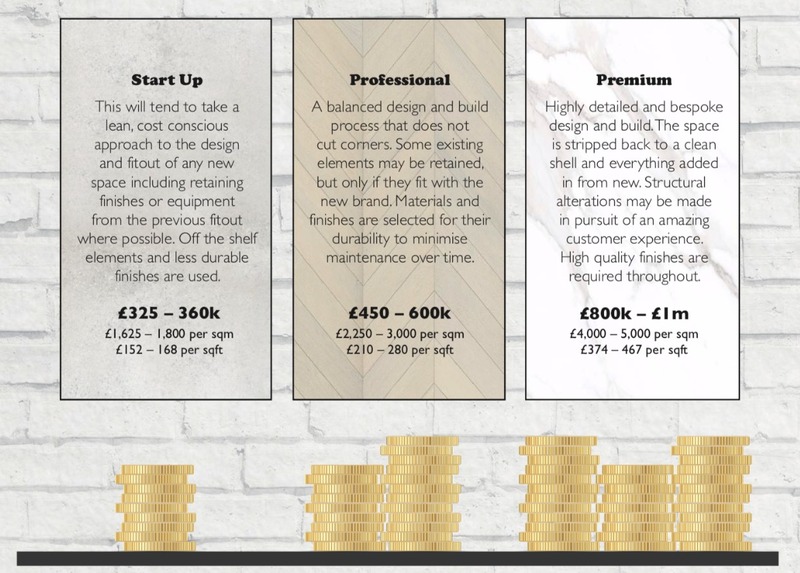 Given that it is one of the first questions we get asked, we wanted to pull together an infographic to offer some guidance on the cost of building a restaurant, based on our own experience. 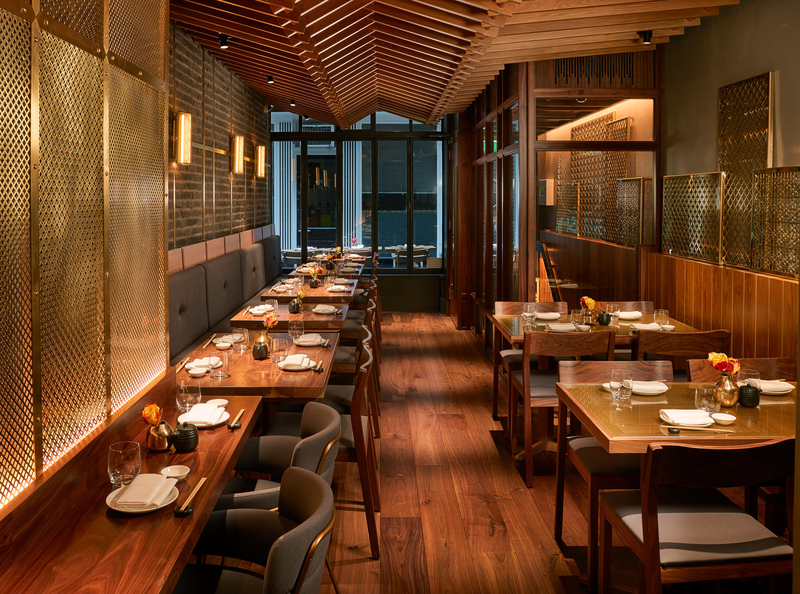 Just to be super clear, we are not Quantity Surveyors or cost consultants – we are architects that design restaurants and are therefore heavily involved in cost based conversations around design feasibility. We offer this guidance based on our experience working with many different clients, shopfitters and landlords with the sincere hope that it is useful in giving you a basic, realistic framework. We would strongly advise that when building your business plan and, even more importantly, embarking on a new project, you consult with relevant experts to build a specific cost framework for what you are trying to do. So, with all that in mind, let’s talk about the actual cost to build a restaurant. There are a few different factors that you’ll need to consider when thinking about costs, and naturally, it starts with where it will be located and how big it needs to be. In order to be specific, we have based our figures on a 200 sqm high street location in London. You might be interested to know that the average size for high street chain restaurants is usually in the region of 350-400 sqm, but we wanted to offer guidance on a size that would be insightful for smaller operators or those looking at a one-off site. Finding the right location is, frankly, a dark art as much as a science and clearly has an impact on your chances of success. It’s too big a subject to address in this post, but finding yourself a good property advisor is where you need to start. When looking at the figures below, be aware that we have not allowed for any costs associated with rent, key money, overheads, staff costs, food costs, etc. It is simply based on the design and fit out. Naturally pretty important and the part that serious chef lead concepts get very excited about. It covers all the equipment ranging from combi ovens and plancha grills to walk-in chillers and the dish wash sinks. It also includes any back of house and staff areas. As a rule of thumb, this area takes up 30-40% of your physical restaurant space. This relates to the floors, walls, ceilings and shopfront. Strictly speaking, we might call this ‘builders work’ or ‘building fabric’ as normally most of the shell of a space is provided by the landlord and you are working within it. It includes structural work you might do, new windows or staircases you add, any partitions created to divide up the space, false ceilings and feature rafts, etc. This really covers fitted and loose furniture. So, things like display cabinets, bars, maitre de stations, banquette seating, etc are joinery whilst loose furniture is pretty self-explanatory – tables, chairs, and stools for your eager customers to use. This is an area often underestimated by new restaurateurs and the costs can be surprisingly high, particularly when going into a new building rather than taking over a site that has been previously used as a restaurant. MEP stands for mechanical (ventilation, air conditioning and kitchen extract), electrical and plumbing. If sprinklers are required, they would also fall under this category. One of the most important things to assess when looking at a new site for a restaurant is the feasibility and costs around kitchen extract and plant location – it can make or break the feasibility of the project. On the electrical side, a typical restaurant of this size would need 100-200 Amp, 3 phase power. Naturally, you need a team to deliver your project although the extent of that team might depend on both your own level of experience and specific landlord requirements. You may need to allow for an Architect, Quantity Surveyor, Project Manager, MEP Engineer and Structural Engineer as part of your team. And don’t forget the Lawyers, which could account for £5-12k on their own. In the military, there is a saying that no plan, no matter how detailed, survives beyond the first encounter with the enemy. Similarly, no design project in the history of civilisation has proceeded completely to plan. When building a restaurant, there are going to be unexpected things that come up for all sorts of different reasons – discoveries on site not revealed in the survey, landlord demands, local authority approval conditions, sourcing issues, client brief changes, miscommunications and simple human error. Please save yourself part of the stress, by allowing a contingency fund. Projects can be stressful enough, without this burden. If you’re going for the approach we might term “startup”, you’re looking at the lower spectrum of cost which still ranges between £325k-360k. This means you will need to keep budget firmly in mind during the design of your space – it will involve a combination of efficiency and creative use of low-cost materials. The two questions to keep in mind are “will this really make my customer experience better” and “will this really help my staff do their job” In order to make this price range work for you, you will need to take a very smart approach to reuse equipment and fixtures from the previous tenant. If you are going into a blank shell, then achieving this budget is unlikely as there is nothing to reuse. The costs for this typical approach range from £450k-600k. With this type of plan set in place, everything is focused on creating a relatively new space. While it might be suitable to save some fixtures and elements from the previous design, that’s only a good idea if it works with your new brand aesthetic. This option also allows for a better quality of materials and higher level of detailing in the design. It also allows for longer-term decisions to be made, for example buying slightly more expensive but more energy efficient kitchen equipment to lower future bills and using very durable materials to minimise future maintenance. The vision of your restaurant is everything at this level and has to be delivered with very little compromise. Therefore, you’re looking upwards of £800k-1m for the design and fit out. Unlike a “startup” or “professional” approach, you’re essentially starting from scratch and completely cultivating the space into a high profile new venture. Customer experience is everything and you need to attract the best staff to work for you, so nothing is left to chance – all of the customer-facing spaces are finished with the best materials, whilst the operational layout for staff is as precisely engineered as a machine. To deliver this level of excellence, it takes a lot of coordination, so more consultants are likely to be involved. Choosing a location outside of London! This will immediately cut some of your costs down (not only on fitout, but certainly a lot on rent, rates. etc which may give you more funds to build the actual restaurant). You are likely to be more hands-on in managing the project and look for alternative/ DIY ways to make the project happen. This is often fraught with risk and patchy results due to lack of experience. Find a location where there is a good amount of fixtures and fittings that can be reused – if you can minimise changes to the MEP and Kitchen, you will be able to have more impact on the front of house areas that really create your customer experience. You choose a difficult site with lots of alterations to be made. You want to create a truly luxury or iconic experience – the sky is the limit in how much you can spend here. There are very strict landlord requirements that impact on the design. As mentioned before, a lot of this is dependent on the location. In addition to the above, areas like shopping centres often have more onerous design and fitout requirements (quality of materials to be used, requirements on MEP, extra consultants required, more detailed project management needed). Anecdotally, these can add 20% to your budget figures compared to a high street location. Unlike shopping centres, listed buildings won’t necessarily take a direct toll on your budget but they are likely to add considerable time to the project and you will need to engage a certain level of professional to undertake the work.